Several weekends ago, we had a pleasant surprise from a visiting priest at our parish. His name was the Most Reverend Herbert A. Bevard, the Bishop of the Catholic Diocese of St. Thomas in the U.S. Virgin Islands. And he gave a most heartfelt homily that touched me deeply. St. Thomas, he said, is beautiful, a tropical paradise. There are white sand beaches and pristine aqua blue waters everywhere you look it seems. And if you stay at a Marriott or a Ritz Carlton or any of the numerous resorts there, hotel employees attend to your every need. Yet for all the beauty and luxury most tourists see, the Diocese of St. Thomas is ironically the poorest diocese in the United States. Its eight parishes are among the poorest in the nation. But because the diocese is part of the U.S. it does not qualify for support from any international mission organizations, and so it is dependent on the generous support of other parishes in the U.S.
Bishop Bevard lamented today's culture. "We are a throw away society. When we don't want something, we just throw it away." The poor in his diocese are victims of this mindset. They live next to dumps and abandoned cars, looking for their next meal or anything of value as they rummage through refuse and piles of trash. You can imagine the stench that must be overwhelming. They are struggling to stay alive while most of us have never missed a meal. This is extreme poverty. Bishop Bevard described a sad experience. He would visit villages when he could and bring a bag of fruit and another bag of candy for impoverished children. When the children saw him, they would run towards him and eat all that he had. But one time one little boy came too late. By the time he got to him, there was no more food to give. The little boy begged but the bishop said that both bags were empty. He told the little boy to go back home and ask his mother for food. Sadly, the boy said that it wasn't his turn to eat that day. He had eaten yesterday and today was his sister's turn to eat. The bishop said that it was his first time to ever hear such a thing. For most of us, a lack of food is not a problem. Usually we have an abundance of things to eat. So the little boy's heartbreaking situation is so foreign that it is beyond comprehension. 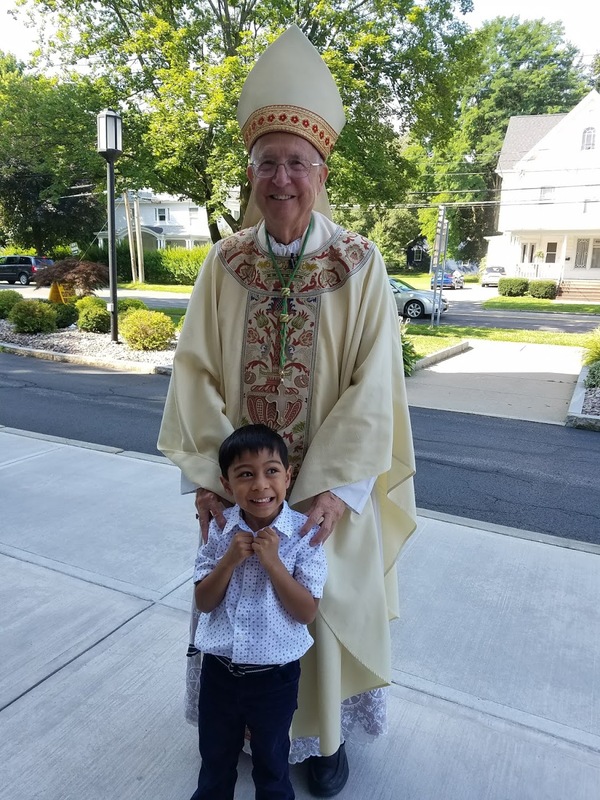 As head of the nation's poorest Catholic diocese, the bishop is the voice of the many hungry children who desperately need help from those who can generously give. In his homily, the bishop also mentioned that he had converted to Catholicism. He was eleven years old when the idea of becoming a Catholic came to him. He had never stood inside a Catholic church before but he decided to talk to a priest. The priest asked him to serve Mass with him the next day. The young Herbert Bevard was surprised as he did not know that Mass was said daily. The priest also explained the miracle that happens each time the priest consecrates the bread and wine. Because of that he wanted to become a priest. He told his parents and his parents' response was to send him to military school. He never had the opportunity to go to Mass or see a priest during those years but his desire to become a Catholic never waned. He prayed the Hail Mary often and this sustained him. After graduating from military school in 1964, and with his parents no longer resistant to his desire to become a Catholic, Bishop Bevard was baptized in the Catholic church. In 1976, he baptized his mother and brought her into the church. He also eventually baptized his father and brother. What a beautiful conversion story! And the bishop explained that all of this was possible because of the goodness of the Blessed Virgin Mary. He said, "Remember the Blessed Mother always. Give everything to the Blessed Mother. She will ensure your admittance into heaven." Before ending his homily the bishop asked for prayers. He asked that we pray for the people of his diocese, and to also pray for the priests of the diocese who work so hard and who have left their homes and families to do God's work. Finally he asked, "And pray for me." Yes, Bishop Bevard. I will pray for you, a kind hearted and humble servant of God. I will pray for you and your Godly and holy mission. May Our Lord and His Blessed Mother protect you and strengthen you all the days of your life. Amen.